Fun, colorwash Bible cover! 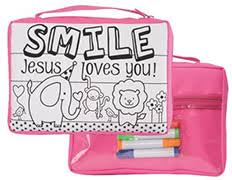 "SMILE Jesus loves you! Just color with washable markers, machine wash cold, hang to dry & color again! 4 FREE washable markers are included.